Today's investor is encouraged to diversify his portfolio not only by industry but also by geography. But when comparing companies across international boundaries, investors must be cognizant of the existence of varied accounting rules by country GAAP. That is, identical companies will show different results depending on which country's GAAP each is following. For the average investor who is not privy to the internal accounting discussions of a company under study, comparing results by taking country GAAP into account is a tall order. Certain adjustments may be made related to depreciation methods (e.g. straight line vs accelerated) or useful life assumptions, but in general many investors may simply ignore the differences which they cannot quantify. According to the study, companies in the UK are the most optimistic, and not by a slight margin. In general, this would require reducing earnings from a UK company by almost 25% for it to be comparable to an American company. At the other end of the spectrum, Japan uses the most conservative accounting methods, showing profits almost 40% lower than what would be shown by an American peer. It should be noted, however, that this study was published in 1997, and since then there has been a progressive movement towards IFRS as a standard rather than individual country GAAPs. Therefore, the study will no longer be relevant for several of the countries surveyed. Nevertheless, when comparing companies, the prudent investor will adjust for the fact that different accounting principles will yield different results. Rackable Systems (RACK) provides computer servers and storage devices for use in data centres. The company has $170 million worth of cash on hand versus no debt, yet it trades on the Nasdaq for just $120 million. The company has announced a plan to buy back $40 million worth of stock. Unfortunately, despite the strong balance sheet position, there are risks associated with this company. It operates in a constantly evolving high technology field. Success for this company is dependent on generating interest for new products/services which could be hits, and could be misses. As we've discussed, value investors prefer companies in stable industries with stable operating histories, as this gives us more predictability going forward. The company intends to use up a portion of its cash position making investments to shore up its product line. Unfortunately, it's not possible to tell how those investments will turn out, increasing the speculative element of this stock. The company's history with its investments is not good: operating income in each of the last two years has come in south of negative $30 million. Certain investors for whom the products sold by RACK fall within their circle of competence might feel very comfortable valuing this company with some level of certainty. For the vast majority of value investors, however, this will not be the case. While it is certainly appealing to invest in stocks trading below their net current asset values, investors must still use sound business judgment to eliminate the stocks which are burning through cash and for which the future holds too much uncertainty. This chapter is devoted to a discussion of stock options. The author critiques some of Buffett's takes on options, while applauding some of his suggestions. While Janjigian doesn't come right out and say it, it appears he is not in favour of the now required expensing of stock options. While Buffett has made it clear that he believes options should be expensed, the author takes issue with Buffett's logic. Because the value of options are difficult to measure at the date of grant (since they can end up being worth nothing, or being worth a whole lot more than expected), the author's take is that expensing them is not as straight forward as it is for other uncertain expenses such as depreciation (where the cost of the purchased good is at least known). The author believes the real problem is abuse of options. Excessive grants, re-pricings and backdating are all forms of abuse that shareholders should be looking to curtail, rather than focusing their energies on forcing option expensing. Diluted Earnings Per Share already accounts for outstanding options, so the author suggests expensing is unneccessary. The mandatory expensing of options has lead to a drop in this form of compensation. The author seems to believe this will stifle new companies, many of which cannot afford to pay enough cash to attract top managers. Unfortunately, this argument seems rather flimsy, as it could also be taken to the next step in a claim that depreciation should not be "expensed", since this would curtail necessary capital investments. Although the value of options is uncertain, Buffett's argument is that we should make a best effort to put some expected value on them, rather than have the income statement completely ignore them. The public often views Buffett as pro-shareholder and a fan of good corporate governance. But Janjigian points out that Berkshire falls short on several fronts when it comes to corporate governance. For example, governance experts suggest that a company's CEO and Chairman position should be occupied by different individuals, but this is not the case at Berkshire where Buffett holds both roles. Berkshire (until recently) also didn't meet governance standards when it came to the number of independent directors on its board. As recently as 2002, the board of Berkshire consisted of only 7 individuals. There were three Buffetts on this board, along with Charles Munger and Richard Olson (a partner at Munger, Tolles & Olson LLP). Therefore, clearly 5 of the 7 board members were not independent. In fairness to Buffett, however, he disagrees with the definition of "independent" when it comes to directors. Buffett believes that while those whose association with the company results in their receiving a large portion of their income from fees for being directors are regarded as independent by the experts, they are actually the least useful. Instead, Buffett would rather have directors with a substantial investment in the company, since these individuals are most likely to be on the side of shareholders when it comes to company matters. Buffett has also failed in his succession planning according to Janjigian. For most of Berkshire's existence under Buffett, it has not had a plan in place. It should be noted that currently Berkshire does have clear succession planning, but it took an NYSE requirement to get this process started. Even so, no one person will do Buffett's job, as his job will be split between someone who runs the business, and someone who runs the investment operation. As such, in all of Buffett's years at the top of Berkshire, he has not trained anyone who can truly take over his position. The following post was written by Peter Schiff, who regularly writes for Money Morning. Recently, Peter authored a new book titled Crash Proof. The opinions expressed here do not necessarily reflect those of Barel Karsan. About the author: Peter D. Schiff, Euro Pacific Capital Inc.'s president and chief global strategist, is a well-known author and commentator, and is a periodic contributor to Money Morning. Schiff is the author of two New York Times best sellers: "The Little Book of Bull Moves in Bear Markets,"and " Crash Proof: How to Profit from the Coming Economic Collapse"." For a more-detailed analysis of the nation's financial problems, and the inherent dangers that these problems pose for both the U.S. economy and for dollar-denominated investments, click here to download Euro Pacific's new financial-research report, "The Collapsing Dollar: The Powerful Case for Investing in Foreign Securities." In the midst of an ongoing financial crisis that's eradicated trillions of dollars in shareholder wealth, the profit search facing U.S. investors is tougher than ever. The uncertainty surrounding the economic-stimulus and banking-bailout plans isn't helping. But a free report provides insights into the threats those plans pose. Investors who subscribe to the Money Map Report can obtain a complimentary copy of Schiff's best seller, "Crash Proof," in which he details the causes of the housing bubble and financial-system collapse, and tells investors how to dodge losses from the problems that are still to come. To read the free report, please click here . Thanks to what he calls an easy but effective investment approach, Derek Foster retired at age 34. He wrote two books, Stop Working and The Lazy Investor, which extolled the virtues of investing for the long term. In those books, Foster suggests buying great businesses that pay dividends and holding them forever: "Remember selling stocks, like divorce, comes at a high cost." Stock market crashes generally don't affect dividend payments for the kinds of investments I own, so I welcome a market crash with open arms! It simply won't affect my retirement. So Foster must be salivating at current stock prices, right? Or at the very least, surely he's sticking to his investment philosophy? Actually, Foster has decided to completely liquidate his portfolio! In a stark demonstration of how market psychology can dramatically alter sound, logical behaviour, Foster has completely reversed course. Foster is now quoted as saying that this economy is going through a paradigm shift, and he does not want to hold stocks through that period. But in the very same interview, he states that this is just a 'temporary thing', and that his absolute goal is to get back into stocks. It is precisely this type of psychological effect that stock market crashes have on investors, which allows value investors to buy companies at terrific prices! Have you ever examined a company's financials from last quarter, but wondered how well the company is doing right now? We'd all like to know the future; after all, when we buy a stock we are buying its future income. Fortunately, there are some clues we can use to get an idea of how well the company is currently doing. One such useful piece of info comes from the "Deferred Revenue" line of the company's balance sheet. When a company receives payment for a service it has not yet performed (e.g. pre-paid magazine subscriptions, a downpayment on a home that has not yet been built, season tickets for a sports franchise, gift certificates at retailers), it does not get to record revenue, so this money does not show up in past revenue results. However, the company does receive cash and makes an entry under its liabilities called "Deferred Revenue", i.e. revenue it will receive when the service has been performed. Taking a look at this line item year over year can give you a good idea of whether the company in question has decent prospects going forward. Of course, you cannot consider this line in isolation. For example, growth in this line item for a retailer could simply be part of the growing trend of consumers switching to gift cards over hard goods as presents for loved ones, and may not signal that the company's overall sales are strong. Steady deferred revenue for a magazine may signal a sharp reduction in prices, and actually suggest an upcoming downward trend! On the other hand, for some companies steady deferred revenue in this environment can be an indicator of resilient demand for its products. For an NFL football team, steady season ticket revenue (since we're talking about a finite number of seats, as opposed to an unlimited number of magazine subscriptions) in this environment could signal strengthening demand for tickets. For a company like LoJack (LOJN), which takes the cash up front but recognizes its revenues over the term of its service contracts, a look at its deferred revenue changes over time can offer a hint as to whether the company is able to renew contracts at the same rate as they expire. Deferred revenue is only one of the clues we can use to determine a company's future performance. Management guidance, economic and industry expectations can also help. What are some of the other clues you like to use? Readers interested in "seeing the future" on the price of oil may be interested in this free video, brought to you by our sponsors at INO TV. Japan suffered a banking crisis two decades ago. US lawmakers have the luxury of studying some of the effects of the remedies the Japanese government attempted to undertake to cure its ailing economy. One can only hope that US lawmakers won't repeat some of the same mistakes that were made in Japan in order to please constituents in the short term at a heavy price in the long term. Japan had what's known as The Lost Decade, where economic growth stagnated for several years following its credit crisis. While there are many complex issues at play that caused this episode, one of the main problems Japan's economy faced during this time was extremely low productivity growth rates. As we've discussed, productivity growth is the key to increasing a nation's standard of living. The actions and policies of the Japanese government were often a drag on productivity, and the US would do well to ensure it does not fall into these traps. First of all, the Japanese government exacerbated its credit problem by creating what's known as "zombie companies" by subsidizing failing banks and businesses. While these moves likely reduce mass layoffs in the short-term, they effectively are taxes on good businesses to throw at poor ones, thereby stymieing growth of great companies at the expense of poor ones. Japan has also been slow to remove tariffs and laws protecting local businesses from competition. Without competition, firms are able to get by without improving efficiencies, and bad companies are able to stay in business, which saves jobs in the short-term, but is good for no one in the long-term. This would be akin to the US proposing "Buy American" requirements or putting tariffs on Chinese imports. While Japanese exporters are extremely competitive because they are forced to compete globally, domestic companies within Japan are protected in order to for people to be able to keep their jobs. Mom-and-Pop retailers account for 55% of retail jobs in Japan, compared to just 19% in the US. The efficiencies that large retailers bring accounts for the fact that Japanese retail productivity is half of what it is in the US. Similarly, the construction, health-care, and food processing industries suffer from further anti-competitive policies that have resulted in little in the way of productivity gains. Thankfully, the US is a very competition-friendly nation, but special interest groups can at times sway governments to protect certain groups. The Japanese government also embarked on several stimulus packages (as we're seeing now in the US), but these only resulted in ballooning government debt. While stimulus can temporarily spur demand, only with policies that encourage productive growth can economies in the developed world grow in the long run. The US government should keep these issues in mind when determining its policies for navigating its way out of this recession. A couple of years ago, companies were spending hand-over-fist on a slew of director-approved share buybacks. Now that stocks have fallen to the point where companies would get much more value for their buybacks, one is hard-pressed to find any companies confident enough to buy back their shares. One company bucking this trend is TAT Technologies (TATTF), a provider of services and products to the aerospace industry. TATTF managed to improve its year-over-year operating income in the fourth quarter in part due to the fact that it holds certain medium-term servicing contracts with many of its customers, giving it some revenue certainty. Net income for the year was over $4 million, while the company's market cap sits at just $30 million. But the most attractive aspect of this investment is the discount it sells at relative to its balance sheet. TATTF is a Ben Graham net-net, with current assets of $108 million ($45 million of which is in cash) and total liabilities of just $41 million. TATTF is a small-cap which is closely held and controlled by one shareholder, which poses some added risk. But as part of a diversified portfolio, it may offer investors terrific value at this price. While Buffett has undoubtedly successfully purchased many companies at discounts to their intrinsic values, he is only human. This chapter is dedicated to describing some of the investment mistakes Buffett has made. First of all, it is actually difficult to determine when a Buffett investment has gone wrong. Unlike the case with short-term trading, value investments can sometimes take years to show their expected returns. Many of the companies Buffett has purchased have actually dropped in value for a period of time before roaring back. But there are nevertheless some companies Buffett has sold at a loss, and those are described in further detail. Berkshire's investments in Salomon, General Re, NetJets, and Pier 1 Imports are considered mistakes by the author. These investments are critiqued and analyzed. In a couple of cases, Buffett has had to take over active management of the firms, and managed to turn some of them into successes. But these are still deemed mistakes, as the author asserts that Buffett would not have bought in had he known what was in store. However, in many of the cases, the incidents which caused these investments to go wrong would have been difficult to foresee. A rogue trader (Salomon) and hidden liabilities (General Re) would be very difficult for investors to prevent from occurring, so it's not immediately clear what the reader is to learn from these mistakes. In this chapter, Janjigian discusses some further criteria Buffett considers before buying a company. It is stressed that Buffett puts a tremendous amount of weight on the quality of management. He has often spoken about the importance of good managers. The author examines the details (that are public) of various purchases Buffett has made over the years, including those of Forest River, Business Wire, Iscar Metal, PacifiCorp, and Russell Corp.
Buffett's approach to finding investments is also explored. The author says he does not go looking for companies, instead preferring to wait for the right opportunity to come to him. He is certainly not afraid to hold cash, unlike most of the trigger happy portfolio managers littering the finance industry. Although Buffett is known as a buy and hold investor, Janjigian points out many instances where a stock has remained in Berkshire's portfolio for only a short period of time. Examples of such companies include Best Buy, Gap, and PetroChina. From the above chart it appears that investor sentiment is highly cyclical, as margin calls appear to force reductions of debt levels when recessions hit, while investors dramatically increase debt levels when the market rises. It appears that many margin investors are still holding their investments steady, despite the grim outlook for the economy, which may suggest market confidence has not yet gone as low as it can go. It's worth noting, however, that this data is only current to January, and considering the market's steep drop in February, many margin investors may have been spooked; therefore it will be interesting to revisit this data when the February stats have been compiled. Dorel (DIIB) manufactures and distributes products in three segments: juvenile (strollers, car-seats etc. ), leisure (mainly bicycles), and home furniture. The company's fourth quarter results held up very well despite the downturn, suggesting many of the company's products are recession proof. But the stock price has taken a hit, even though earnings are relatively stable. As a result, the P/E for this stable, profitable company is around 5! Martin Schwartz has been CEO since 1993, and is also Chairman of the Board. Due to Dorel's dual-class share structure, the Schwartz family controls 70% of voting shares despite owning only 10% of the company's share capital. In Security Analysis, Ben Graham has warned us to be wary of instances where ownership control and risk are not aligned! Furthermore, the company has mostly retained its earnings for the purpose of acquisitions. This company has instituted a dividend only last year, as historically they have used retained earnings to finance acquisitions. This continued in 2008 with a $200 million purchase of a US bicycle manufacturer. An additional risk the company poses is that 30+% of its sales are to one customer (likely, Walmart) with another 10% to either K-Mart or Toys 'R Us. Since there are no term contracts with these customers, a change of heart on their end would have a material adverse impact on Dorel. Despite these risks, there appear to be value investors interested as late as last year, with Tattersoll and Franklin Templeton owning 10% each. As part of a diversified portfolio, DIIB appears to offer investors the opportunity to buy a stable, profitable company at a terrific price. Interested in another perspective on DIIB (or any other stock that's currently on your mind)? MarketClub.com has offered our readers a free analysis of a stock of their choosing here. In the interest of full disclosure, we would like to make it clear that we receive compensation for each reader we send that has a stock analyzed, so we encourage you to check it out at no cost to you. You never know, you might find something you like! Disclosure: Author owns a long position in DIIB. 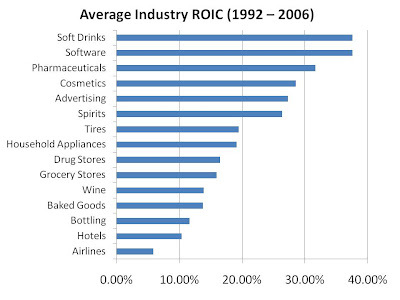 Does this mean you shouldn't own a company whose industry returns fall below the average ROIC? Absolutely not! Within industries, returns may also be highly variable, in the case where one or two companies have differentiated themselves or are low-cost producers that generate consistent industry-beating returns...but you may still want to stay away from the airline industry! Returning visitors to the site may notice that the site has a new look! Thanks for bearing with us over the weekend as we integrated the new features. Please let us know if you notice any problems. We believe there are some benefits to this new look over the old one for both the site's writers and its readers. First, we're able to better organize the information on the site. For example, the tabs at the top enable easier access for readers to the site's content, which is something our readers have been asking for. Another benefit (we hope!) is that ad space is used more effectively. A large part of the site's revenue comes from users clicking on google ads. Unfortunately, our click rate under the old design was apparently well below normal, so hopefully the current location of the ads is a little more catchy, allowing readers to better see and click on advertiser links that interest them. Please don't hesitate to let us know what you think of the new look, either by commenting on this post, or contacting us by e-mail. Many thanks to Brad, who writes regularly for Triaging to Financial Success, for getting this process started. The moral of this chapter is: "Never Marry A Stock". The author points out a number of instances where some of Buffett's stocks may have traded above intrinsic value, but Buffett has not sold. Unfortunately, this costs his shareholders money. The author argues that Buffett doesn't do this because he doesn't want to maximize shareholder value, but instead this is a result of the fact that Buffett does not think of himself as a stock picker, but instead a buyer of a business. As such, Buffett marries businesses. "You should be fully aware of one attitude Charlie and I share that hurts our financial performance: Regardless of price, we have no interest at all in selling any good businesses that Berkshire owns...[G]in rummy managerial behavior (discard your least promising business at each turn) is not our style. We would rather have our overall results penalized a bit than engage in that kind of behavior." Janjigian also discusses one method of investing that Berkshire is able to do that ordinary investors cannot: Private Investments in Public Equity (PIPE). Large investments in public companies allow the public company to save time and money. Some of this discount can be passed onto the buyer, who gets a deal on a stock that ordinary investors cannot. The author discusses a number of such PIPE deals Berkshire has profited from. In this chapter, the author discusses some of the academic research devoted to studying the performance of value versus growth stocks. As defined earlier, value stocks are said to be those with the lowest P/E and P/B values, while growth stocks are those at the opposite end of the spectrum. The author concludes that value stocks do outperform growth stocks over time, citing and discussing several studies. It is worth noting that value stocks do not outperform in all periods, however, the longer an investor sticks to value investing, the more likely he is to outperform the market. Within the value stocks, the author determines that the small-cap subset outperforms the most. Buffett clearly agrees, as he has stated many times that as Berkshire gets larger, he cannot possibly match the returns he was able to achieve back when he was starting out. Though Buffett and many value investors tend to buy and hold, the author does argue that traders do provide a valuable service. They offer liquidity to the market which would not otherwise be present, thus lowering trading costs (lower bid ask spreads, more scale for brokers etc) for all investors. It is also noted that traders prefer growth stocks since these are the stocks that perform well for momentum investing. Academic research is cites which demonstrates that momentum investing can be used successfully. The media constantly exaggerate stories to the extreme - either positively, or negatively, depending on the circumstances. This shouldn't surprise us; the way they make money is by shocking us into wanting to know more about whatever it is they're discussing. Clearly, estimates that predicted the good times to keep rolling forever were flawed. But it's important to note that the reverse may also be occurring today: doom and gloomers dominate the financial news, but astute members of the public will recognize that this is simply the result of the media once again exaggerating the situation - this time to the negative. Investors who buy when others are fearful and sell with others are greedy have done well in the past, and should continue to do so going forward. Note that Cramer actually appeared on Stewart's show last night. You can watch the full interview here. All the financials of a company can look good. The prospects for its products might seem great, and products in the pipeline may appear to be even more impressive. But a poor corporate governance structure leads to managers stealing profits from shareholders and setting up the company for massive failure. A rather famous classic case involves Enron, which was one of the world's largest energy companies. Enron execs were allowed to override Enron's code of ethics that forbade practices involving self-dealing by executives - and they were able to do this with board approval. Boards are supposed to be on the side of shareholders, but it's clear that in this case they were not. Specifically, Enron's CFO acted on behalf of Enron (which is acceptable for a CFO) in transactions with companies for which he served as partner (totally unacceptable - major conflict of interest!). He was thus able to transfer large amounts of wealth from Enron to himself. These partnerships also served to hide rather large debt obligations that really belonged to Enron. The permission of such activities is not simply the result of one-off mistakes or omissions on the part of the board of directors. Rather, they are the result of a culture of non-independence and poor checks and balances. Investors that don't consider the corporate governance structures of the companies in which they invest are the next potential victims of such shenanigans. In the past, we've looked at Charles Brandes views of what corporate governance should look like. In a future post, we'll discuss how ordinary investors can go about getting information on how well a company's corporate governance structure is working, so that they can reduce the chances of falling victim to such egregious activities. The company's cash+A/R+inventory less all liabilities add up to $265 million. Note that this barebones minimal valuation excludes the company's relationships with customers, its manufacturing facilities, and other intangibles which make this a profitable company. Yet as recently as Monday, the company traded with a market cap of just $120 million! Though we cannot predict which companies will beat/miss analyst expectations by a few pennies, we can still determine which ones have minimal downside and plenty of upside. The AM Castles in this market are a-plenty, for those who are willing to search, analyze, and invest against the prevalent fear that persists in today's market. PACCAR (PCAR) designs and manufactures a wide range of trucks used for commercial transportation. Comparing operating metrics to its competition, it appears to be a well-run company. Furthermore, the company's most recent quarterly results suggest that management anticipated a drop in demand relatively well, as it cut costs and thus managed to stay profitable despite a difficult environment. The company trades with a P/E of just 8, but is cautiously optimistic going forward: fuel costs, a major component of its customers' operating costs, have dropped dramatically. As such, the company has noticed that many of its customers are in positions of financial strength (as compared to previous quarters) and as such are willing to invest, despite the negative economic climate. There are, however, financial risks associated with this company. As part of its operating model, the company finances dealers and various wholesale buyers, and it borrows money to do so. Therefore, even if management does an outstanding job designing and building top-notch next generation vehicles, a poorly run company that has received a loan from PCAR can have a material adverse impact on PCAR. Exacerbating this issue is the fact that PCAR has over $7 billion in debt, and the vast majority ($5.5 billion) is due this year. The company has earned just over $1 billion per year over the last several years, and so it will have to rely on outside financing. While the company's current debtors may find nothing wrong with renewing PCAR's borrowings, investors should be aware that the risk exists nevertheless: if debtors don't have confidence in PCAR's finance receivables (i.e. the loans PCAR has offered to its dealers and customers), the consequences are large. As such, for those value investors who prefer only making the safest of investments, PCAR's model of offering loans to its customers adds an element of risk best to be avoided. Those of you who have followed this blog from its start know that when Reyer and I started posting, we were interested in finding out whether empirical evidence shows that value investing does indeed outperform the market. While studies have shown that low P/E, low P/B and small-cap companies do tend to outperform the market, these anomalies are often explained away by backers of the Efficient Market Hypothesis (EMH) as being the result of high risk companies comprising a larger part of these outperforming groups. Athanassakos, G., Barel, R., Karsan, S., 2009, “Do Value Investors Add Value? Searching for and Finding Value: Canadian Evidence 1999-2007”, January. In it, we analyze financial data for low P/E and low P/B firms for each year in the preceding business cycle. We attempt to weed out the higher risk firms (due to business risk, financial risk, or a combination of the two), as value investors would normally do. We then observe that this process does indeed bear fruitful results, which the reader is encouraged to see for himself! Many thanks to Reyer and George, whose contributions to the paper far outweighed mine! The chapter starts with two seemingly contradictory quotes from Buffett. In one he asserts that his company does not follow standard diversification dogma, and in the other he suggests that 99 percent of investors should diversify extensively. The chapter goes on to discuss that these statements are not in fact contradictory. Diversification is used to reduce risk for investors who have neither the time nor the inclination to study the companies they are buying. In Buffett's case, he knows his companies (and their industries) well. As such, he reduces his risk in this regard, and therefore does not require as much diversification. The chapter continues by discussing some of the finance theory regarding diversification, defining and explaining terms such as variance, correlation and standard deviation. It then discusses why Warren Buffett is not a big fan of this theory: it is impossible to know the above parameters with certainty. For example, you might think airlines and oil prices have a certain negative correlation, but in a market panic you can basically throw that correlation out the window. The chapter also discusses Berkshire's apparent move to diversify over the years. However, the conclusion of the author appears to be that as Berkshire has increased in size, it has had no choice but to do so. It is very difficult to find amazing deals in the tens of billion dollar ranges since the population size of this group is so low. Nevertheless, the majority of Berkshire's investments are concentrated in only a few companies, meaning Buffett is not as diversified as finance theory would suggest. Proponents of protectionist measures will often point to the US trade deficit as proof that the US is losing jobs to cheaper overseas labour. Articles in the popular media will often sensationalize the US trade deficit figures by comparing them to levels of several years ago. However, two factors which contribute enormously to the increased trade deficit are often ignored. 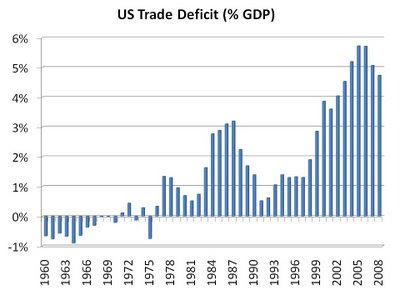 Even by this measure, the trade deficit has undoubtedly increased in the last several decades. It is unlikely that the US can sustain such a deficit for an extended period of time. However, note the recent decline due to the fall in oil prices and reduced consumption, which should continue to persist into this year. The second often ignored major contributor to the trade deficit is the exceptional oil price of the last several years. This number represents about one third of the entire deficit as demonstrated in this San Francisco Fed Economic Letter. However, instead of taking money from successful companies (in the form of government bailouts or protectionist measures) in order to invest in failed companies in old industries that are now disadvantaged in the US for various reasons including a higher prevailing wage rate, the path to prosperity is through the jobs of the future. 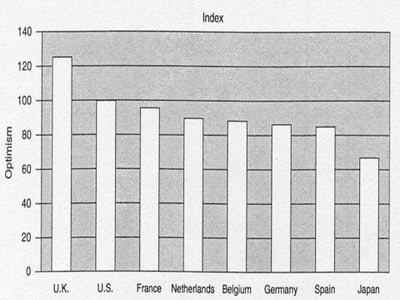 Economists agree that comparative advantage results in increased wealth for both trading partners. Therefore, rather than taxing successful companies (through protectionism and bail-outs of failed companies), the government should pave the way for next generation of jobs that will help carry the country into the next century. For example, considering that 33% of the trade deficit is in the form of oil, the trade deficit can be meaningfully reduced by investing both on the supply side (e.g. exploration and drilling in the US in currently banned areas along with investment in cleaner forms of energy) and the demand side (e.g. more efficient technologies, conservation methods etc) of energy. In a previous post, we saw how protectionism likely contributed to the Great Depression. Headline employment numbers have been awful lately. The US economy shed 600,000 jobs in January of 2009. But certain labour groups have fared fairly well despite the downturn. Understanding how can help us set policies that can help stabilize the economy from future cyclical downturns. For example, we saw here that those with a bachelor's degree or higher are experiencing far lower unemployment rates (around 3%) than those who never completed high school (around 11%). We also saw that teenage unemployment rates are far higher than those of adults, which are likely due to artificially high wage rates. While the differences are clearly pronounced in the chart above, it does not even take into account wage differences between the races. Furthermore, some of the disparities between sub-categories of the races are averaged out in the chart above. For example, the difference is most pronounced between black males, who experience an unemployment rate of 15.8%, versus white females who by contrast experience only a 6.2% unemployment rate. 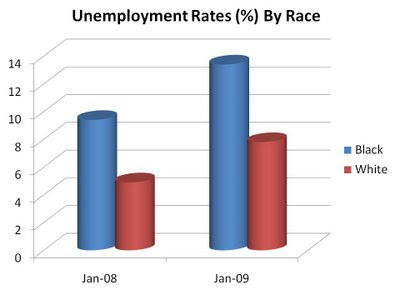 Much of this difference in employment rates may be explained by varying levels of education between the races. But that should be a signal of how important education levels are to an economy. Economists agree that gains from education are not part of a zero sum game. That is, an increase in the number of educated people does not result in fewer positions for those who are educated. It actually results in productivity improvements that increase wealth and opportunities for everyone in society. As such, governments need to ensure that everyone is getting a fair chance at an education, as it contributes to the welfare of the entire country. Although it's easy to get caught up in the market waves of fear and greed (as discussed in this article on Factors That Can Cause The Market To Fall at Go Banking Rates), value investors know to be greedy when others are fearful, and fearful when others are greedy. History has shown this to be true time and again. The latest example comes from Prem Watsa, who has been called the Canadian Warren Buffett due to his outstanding investment returns over several decades. Watsa founded and heads Fairfax Financial (FFH), which recently reported a 16% return on its investment portfolio for 2008, an incredible return of $2.7 billion amidst a brutal market. So how did he do it? As the market became overpriced thanks to an overheated economy, Fairfax held 75% of its portfolio in cash and government bonds, which lifted its portfolio as interest rates dropped in the ensuing meltdown. "[In the fourth quarter, we] removed all...equity hedges and invested approximately $2.3-billion in common stock." Canam Group (CAM) is a US and Canadian infrastructure play. The company builds arenas, bridges, highways, you name it. While many big ticket items have been shelved due to the current state of the economy, government infrastructure spending has increased and is poised to continue to do so. But don't take my word for it: the company's order backlog at the end of 2008 was around $300 million, flat with year ago levels. The company also managed to earn $1/share in 2008, with a fourth quarter and full-year result fairly flat against year ago levels. But the stock price recently dropped to below $5, offering long-term investors the opportunity to buy in at a pretty good price! CAM's debt to equity sits at just 17%. Combined with the fact that it is in a contract-based business and therefore has some revenue certainty (and can therefore align variable costs with revenues in advance), it's a very safe bet that this company will emerge from this recession unscathed. While many companies are too afraid to buy back shares in this economy not knowing what's ahead, Canam management knows its shares are cheap. They have been buying back shares, and have indicated that they will continue to do so, without levering up. Their bridge plants are at full capacity for the next 18 months, which gives management the confidence it needs that its business conditions are okay. On the conference call last week, CEO Marcel Dutil emphasized that this is now his fourth recession in charge, and Canam is better positioned now than at any other time (looking at Canam's D/E in previous recessions shows this to be very true!). He stated that 2009 and 2010 will be years of growth for this company, which is something rarely heard in the corporate world today! The market has punished the shares along with the overall equity market, but with a P/E of 5, a P/B of .5 and a safe capital structure, value investors may see great profits with this stock in the next few years. While wage rates and labour hours can be reduced to a certain extent in order to be more appropriately aligned to demand, rent agreements are often fixed for a number of years. Indeed, previously we discussed how the magnitude of Build-A-Bear's operating leases could prove crippling if revenues continued to fall. "We expect to improve our rent structure with minimal store closures at this point. We are a highly desired tenant with mall landlords...Importantly, in many cases we are negotiating shorter term renewals to maximize our real estate flexibility as we anticipate the mall landscape will change during these times...We’ve been successful in negotiating reductions in occupancy expenses, while maintaining future leased options to re-evaluate stores and ensure they are meeting our assumptions and expectations. Let me assure you in the current environment, improving store lease terms and optimizing store productivity is a top priority." On it's last 10-K, the company reported future operating lease obligations of $423 million. If the company is meaningfully able to bring these costs down, it becomes far less risky, even to this stingy value investor. Coupled with the fact that Build-A-Bear still managed to earn $5 million in its fourth quarter of 2008 (on a market cap of $80 million), investors may have something to get excited about. We'll be watching for an update on these lease obligations in the next 10-k due out in a few weeks! The author discusses some of Buffett's achievements, such as his investing track record and his escalation into the status of the world's richest person. Buffett's ability to generate such returns is in part credited to his unconventional thinking. For example, he likes to see stock prices drop (as he sees himself as a net buyer), whereas most investors like to see them increase. It is also recognized that Buffett knows his limitations, as Buffett will stay away from industries which are difficult to understand. He is also able to withstand the psychological effects that affect the market, best demonstrated by his avoidance of the entire tech bubble, from its multi-year rise to its ensuing collapse. Janjigian also discusses Buffett's buy and hold investment style, and notes that it is not the only way to make money in the market. He also discusses some of Buffett's diversification strategies, even though Buffett himself is quoted many times knocking the usefulness of such strategies. Finally, the author notes that as good as Buffett is, even he has made many mistakes. The book attempts to capture some of these mistakes and lay them out for investors so that they may learn from Buffett's mishaps. Similar to the book's foreword written by Steve Forbes, the author is also critical about Buffett's tax policies. These topics and then some will be explored in the rest of the book!